The Dufferin Grove farmers' market runs year-round, but the holiday markets are a bit special. The farmers still have lots of their own local harvest, and throughout the winter they're allowed to import organic produce from California too. Almost twenty vendors sell organic produce, organic meats, baked goods, tea, and chocolate. There's lots of prepared food as well (including the perogies we sell at the zamboni café, made by the Ukrainian relatives of market vendors Ben and Jessie Sosnicki). Leave yourself extra time when you go there because it's also a place where neighbours run into each other and news is exchanged. To get on the weekly market news e-list, contact market manager Anne Freeman (leave her a message at the park or e-mail her at market@dufferinpark.ca). A little jar of organic mushroom pesto from Fun Guy Farms, made by mushroom growers Bruno Pretto and Paula Vosni. They make all their own mushroom spreads, and then they import one extra: Italian truffle butter in tiny jars, for $10. A package of honey comb and a beeswax candle from bee-man Ionel Alecu. A box of artistic French-style specialty cookies Raymonde’s Little Organic Kitchen, decorated with her signature pressed violets. Maria Solakofski’s Guerilla Gourmet “kickin’” vegan Christmas fruitcake, wrapped in muslin, aged with dark Jamaican rum. Forbes Wild Foods’ Christmas baskets, with dried chanterelles, maple syrup, wild fruit jellies, and lots of other unusual foods. A bag of Kate Williamson’s Best Friend Organic Pet treats: Apple Cinnamon Sniffs, Cheese Chews, Cranberry Rollovers, Peanut Butter Puppy Pleasers, Tuna Tail Waggers. Kate makes all these treats herself and her stand is often surrounded by love-struck dogs. A jar of Colette Murphy’s “Earthly Paradise” soothing herbal skin cream, made with the herbs Colette grows at Plan B Organics farm. A bottle of Angelos Kapelaris’ own olive oil, which he brings over twice a year from his olive groves in Greece. A can of Beate Macklin’s herb tea blend, with flowers as well as leaves. A jar of Melvin Laidlaw’s spicy hemp pesto, Jamaican-style. Besides that, the market will have lots of good plain food at a reasonable price, to stock the neighborhood pantries for Christmas, Hanukkah, and New Year's. 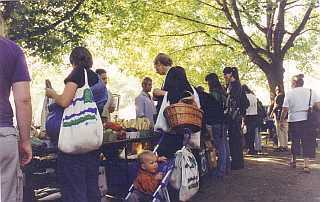 Surely these farmers and vendors are some of the park's best friends - what a privilege to have them come here. The Market has moved to the rink pads (to take advantage of the outdoor lights) for the fall. 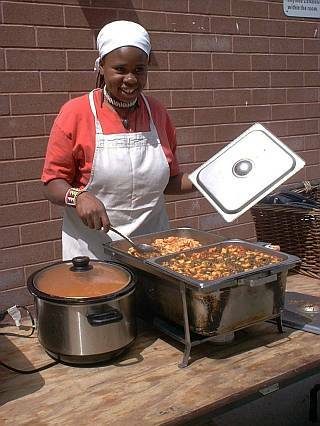 There are now over 25 cooks preparing delicious $2 samples of market food for the Sunday Tasting Fair October 2, 1-4 at the park (2005). posted Sepetember 6, 2005, from the September Newsletter (bottom), updated Sept 27, 2005. Back in the second year of our market, in the fall, we celebrated the market with a "tasting fair." Various Toronto chefs cooked some delicious small item with each farmer's produce. The fair was very popular but also quite a bit of work, so we didn’t repeat it the following year. Now that the market is soon beginning its fourth year, it's time to celebrate again. On Sunday October 2, from 1 to 4 p.m., we'll have the second-ever tasting fair, $2 per item (each one tastier than the next). The only difference this time is that the food will be prepared by various renowned good cooks from this neighbourhood and from the farms – some chefs and some ordinary folks with an uncommonly deft touch with food. The tasting fair will be where the farmers' market is held, or inside the rink house if it rains. So far there are over twenty cooks! Dufferin Grove Park Little Organic Kitchen Taste & Health Organics Inc. Here is the notice we posted about this delicious affair. 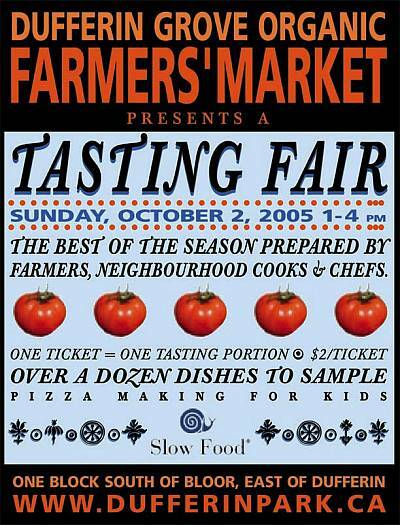 Sunday October 19, 2003, 1 pm to 4 pm near the ovens (or in the rink house if it rains). Return for Pumpkin lantern sailing and marshmallow roast at the wading pool at 6.30 P.M. Chefs and all our regular farmers will be paired at this special event: every table will offer some utterly delicious food item ($2 each) featuring one or more of the ingredients that farmer produces. Those market vendors who are bakers or caterers will offer $2 portions of their best dishes or baked goods. For children, there will also be pizza-making at the oven in case the special foods are a little too adventuresome. In addition, there will be little pumpkins to carve at the pumpkin-table, to get ready for the special event of the evening: a candle-light pumpkin-sailing on the wading pool (and a bonfire with marshmallows), weather permitting.